View our Top Attorneys Emeritus, attorneys who have been named finalists four years or more from 2009 through 2013. Don't miss out on this wonderful opportunity to recognize your peers or congratulate attorneys from your firm. Highlight your firm's expertise by advertising or sponsoring Top Attorneys 2015. Call 619-232-4381, email contact@sddt.com, or see our flyer for more information today! Aug. 13, 2014 -- Reporter Doug Sherwin speaks with attorney Randy Kay, partner with Jones Day and a 2014 Top Attorney, about why there's a surge in trade secrets litigation. 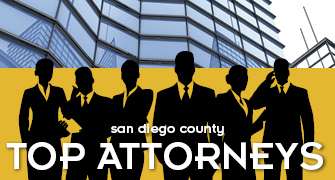 Watch all of our Top Attorneys 2014 videos. Aug. 13, 2014 -- Reporter Doug Sherwin speaks with attorney Jamahl Kersey, of The Law Office of Jamahl Kersey and a 2014 Top Attorney, about immigration reform. Aug. 13, 2014 -- Reporter Doug Sherwin speaks with attorney Mikel Bistrow, partner with Ballard Spahr LLP and a 2014 Top Attorney, about real estate finance and how it's changed over the past several years. Aug. 13, 2014 -- Reporter Doug Sherwin speaks with Jeremy Evans, managing attorney at California Sports Lawyer and a 2014 Top Attorney, about how law and sports intersect.